Sorry I haven’t posted in a while. Sometimes life gets in the way and sometimes one just need to take a step back. In this case, it’s a little of both. In regards to life getting in the way, be assured that it’s nothing bad. As some of you may know, my husband and I foster kids. Generally, we only foster one at a time and one between the age of 6 and 12. A few months ago, though, we were talked into taking two teenagers, a brother and sister. We were told they were well-adjusted, well-mannered kids and this has turned out to be totally true. Still, parenting can be a busy job. We are also in the process of adopting a two-year-old boy from China. The paperwork for this process has been a terrible headache. It’s not just a matter of filling out forms, but also a matter of gathering specific documents and making sure they are from the right sources, in the right format, with the correct information, with the right signatures, and with the right dates. I can’t show you pics of our foster kids, but here’s the boy we’re in the process of adopting. We’re naming him Edward, or Eddie for short. I had to take a step back from my writing and from blogging for other reasons as well. To put it simply, I just needed a break so that my mind could recharge. Not too long ago, I told you how I received feedback from a content editor. She pointed out several core story problems that I needed to work on. Although it was hard to swallow the criticism, I knew she was right. But I wasn’t entirely sure how to fix the problems. That was back in March, 2017. Rather than ponder the problems right off, I took a few weeks off and completely stepped back from my novel. I binged on Netflix and read a few fantasy and sci-fi novels. When I felt I had wasted enough time, I dived back in. And when I dived back in, I devoted almost all of my free time to the novel itself. I didn’t blog. So where do things stand now? We still have our two teenagers so I still devote time to them. The adoption process is pretty much done and now we’re just waiting for the government organizations to get organized. I’ve found the time to ponder the story problems and have come up with some great ways to fix them. And now I’m in the process of rewriting parts of the novel. In fact, I believe I’m almost done. Now that I’m back to writing and nearly finished with the rewrite, I figure it’s time to get back to blogging. This post is a rather boring and personal post, but hopefully next week I’ll be able to post something more useful for you. Any topic in particular that you’d like me to cover? Writing tips? Publishing tips? Editing tips? Or perhaps you just want to read a part of the rewrite? Feel free to comment below. It has been almost a year since I’ve posted something useful. I can’t believe a whole year has gone by since I’ve done any serious writing! And so it should be no surprise that my New Year’s Resolution is to start writing again. Before I tell you my 2014 writing plans, let me tell you why I haven’t written in so long. 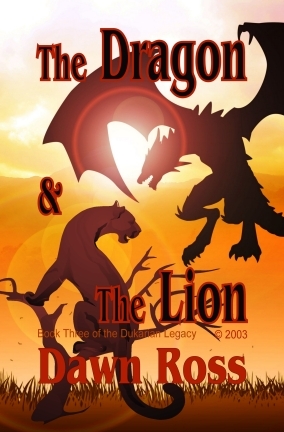 Firstly, I wanted to finish the editing on my third book, “The Dragon & The Lion”. I meant to have it done at the beginning of 2013, but got distracted. As a result, I didn’t finish the editing until August. Available on Amazon as an ebook or paperback. Search dawn ross dukarian legacy on Amazon or click the book cover image above. The second thing that distracted me from my writing is school. I have some college credits, but I never did get a degree. So here I am at age 40 and attending college once again. This past semester course included Accounting II and Business Law II, both of which required a lot of study. You may know from my previous posts that I also run an online business for pet car safety supplies. You’d think running a website would be easy, but it’s not. If I want people to find my website amongst the millions of others out there, I have to work hard. So instead of writing a new book, I’ve been writing blog posts about dogs, writing articles, and networking in the dog blogosphere. Enough with the excuses! Even though I’m still going to school and still running my business, I fully intend to find the time to start writing again. I’m going to start with finishing a fantasy novel I started years ago. It is called “The Guardian of Destiny” and I’ve blogged about it before. In fact, the book is already a fifth of the way done. And I have the rest of the story clearly mapped out. 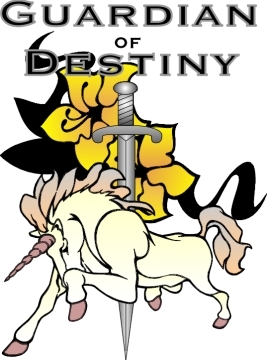 While I finish writing “The Guardian of Destiny”, I am also going to write blog posts telling about my writing process. I am going to start from when I first came up with the idea for this book. Look for my first blog post on this process next Friday (the 10th). I hope to have a new blog post for you each following Friday after that. So there you have it – my New Year’s Writing Resolution. Are you making any resolutions this year? “Where have you been?” I hear you all asking. I just had an email conversation with someone and directed them to this blog where I have some of my fantasy art posted. When I did that, I realized that I have not posted here in a very long time. I have a lot of excuses as to why I haven’t but I won’t bore you with all that. Let me just cut to the chase and say that I am still here. And I will have book three of the Dukarian Legacy published before the end of summer. I wish I could give a more definite date, but I have so much going on that it is difficult for me to stay on track. I only have 10 more chapters of the third book to edit. Then I need to design the book cover. And my final step will be to publish it on Amazon. Sign up for an email notification so that you can be alerted to my next post, where hopefully it will be to tell you The Dragon and the Lion is finally done!